With Tony Arata, Malcom Holcombe, Fred Knobloch, Suzi Ragsdale, Verlon Thompson and others. 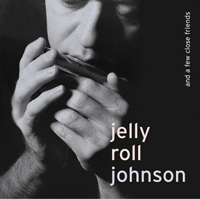 Many of Nashville's greatest artists can boast of Jelly Roll Johnson's artistry and soul added to their albums: Shania Twain, The Judds, Randy Travis, Trisha Yearwood, Kenny Rogers, Jo Dee Messina, Alabama, John Michael Montgomery, Ricky Scaggs, Hal Ketchum, Alison Krauss, Kathy Mattea, Tim McGraw, Reba McEntire and Lee Ann Womack, are just a few. The singers/ songwriters here perform all vocals and most of the acoustic guitars: Tony Arata, writer of Garth Brooks' hit The Dance; Malcolm Holcombe; J. Fred Knobloch, co-writer of Faith Hill's If My Heart Had Wings and George Strait's smash Meanwhile; Suzi Ragsdale and Verlon Thompson, who penned the Trisha Yearwood hit You Say You Will.